Layers of Privilege, or "Your Activism will be Intersectional or It Will Be BS"
Privilege, while in many ways constant, is also always relative. You can have privilege in one aspect of your life - say, being white - and not in others - living in poverty. Just as identities and labels shift depending on context, where you stand at any point in time is dependent upon your social context and the privileges and identities of those around you. However, the areas in which you aren't privileged do not negate your other privileges. You can still be part of a dominant, privileged group while belonging to another marginalized group. A white gay person still has white privilege, even if they will face discrimination and oppression for being gay. LGBTQ+ people of color will face discrimination for being both LGBTQ+ and for being people of color, and for being both at the same time. Multiple areas of marginalization compound and create a unique system of discrimination against people who fit into that subcategory. It is vital that we account for and explore the ways in which intragroup differences affect discrimination, systems of power, and the ways in which we talk about them. We call this framework intersectionality. This term was coined by scholar Kimberlé Crenshaw (pdf), in regards to the way that black women exist as both targets of sexism and racism. These systems of oppression intersect to form a blend of racialized sexism (referred to as misogynoir when discussing black women, and transmisogynoir when it's specifically only transgender black women) that specifically affects those women in ways that women of other races do not experience. Intersectionality seeks to re-center and reframe issues around these unique combinations instead of from the viewpoint of a dominant group. Instead of looking at an issue from the outside and trying to force a single narrative, we look at it from another perspective entirely. Intersectionality is not an ideology so much as it is a method and a framework for how we look at marginalized identities. 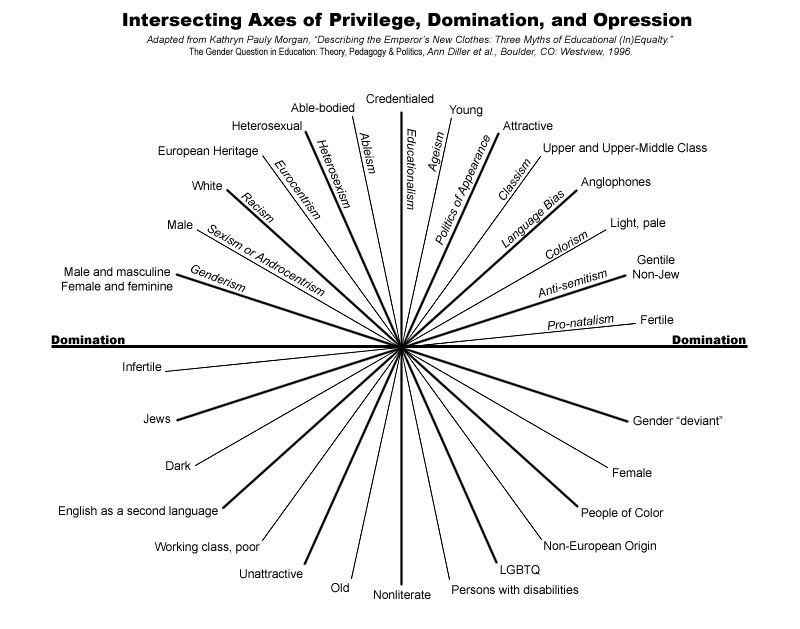 There are infinite ways in which axes of oppression can intersect, and infinite ways in which any person can have privilege - as many ways as there are identities. Identity is not just a static equation. We are the sum of our parts but also a whole being. Intersectionality looks at how the sum of the parts affects the experiences of the whole being. No one wakes up in the morning and asks themselves "Am I Black today or bisexual first?" but far too often we're expected to by those who make up the "default" or norm -- those within a group who have the least disadvantages. Ignoring intersectionality often forces people within groups to choose which identity to support at a time, rather than looking at the whole package. Let's look at some real world examples. In feminist discussion many talk a lot about how the "damsel in distress" trope isn't empowering but infantilizing, because it assumes that women are delicate and aren't capable of saving themselves. That narrative isn't the case, however, for women of color, who historically have always been expected to save themselves, and, with the exception of most stereotypes of East Asian women, are very rarely in history described as delicate. In reframing this discussion around the experiences of women of color (instead of holding those of white women as the standard), we find it's far more empowering and humanizing for WOC to be portrayed as damsels than otherwise - than the dehumanizing Mammies, always expected to take care of everyone else; or the Strong Black Woman, the "mule," expected to carry the weight of the world on her shoulders; the Fiery Latina, etc. Intersectionality allows us to fully deconstruct issues within large identity groups by examining the ways in which overlapping identities change the story. Perhaps this past week you watched the Academy Awards and heard a speech given by Patricia Arquette about the wage gap - how men in the USA, as a group, earn more money per hour than women do. While studies have shown that the wage gap is a verifiable reality (and not a myth as many would like you to believe), what Ms. Arquette completely failed to take into account is intersectionality and how systems of oppression are related to each other. Her views of the statistic are centered around women like her (white cisgender able-bodied women) and are not a reflection of all women's experiences. White women still benefit from white privilege. For every dollar that a white man makes, white women earn on average 77-80 cents. 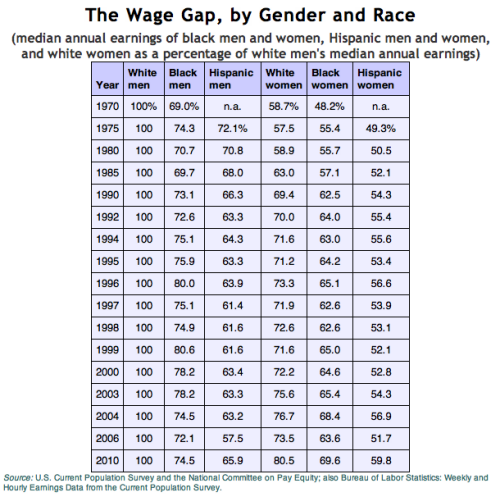 Black men earn less than white women, an average of 75 cents. Black and Latina women earn even less than that (70 cents and 60 cents respectively). As you can see, it's not just gender that makes a difference. But this chart is still missing huge amounts of data. Transgender status, disability, orientation, and other marginalized identities also affect wages. (There are disabled people in this country making less than 20 cents an hour - and their employers are legally allowed to do so. Disabled people on average make 37% less than people without disabilities.) And the more identities overlap, the bigger the difference it makes. Regarding that same speech - the concept of intersectionality also comes into play when discussing the comments that came afterwards. Ms. Arquette said that people of color and LGBTQ people should be supporting her feminist struggle because "she's fought for [us]." This is an intersectionality fail because the categories of "people of color" and "LGBTQ" also contain women. Women who, due to their belonging in multiple marginalized identity groups (and ossibly all three mentioned) are far more likely than Ms. Arquette to be affected - and more - by wage gaps and wealth inequality. In her statement, Ms. Arquette essentially set women of color and women within the LGBTQ community aside from her concept of "women," turning them into the "other." (And as I said on the very first day of this blog, intentions are irrelevant. The omission/accidental often speaks louder than words.) She failed to take into account the ways that identities are not completely separate from each other, and in doing so, demonstrated her privilege. She still faces sexism for being a woman, but across multiple power structures and systems of oppression she still has more advantages than many other women and still contributes to their oppression. Let's look at one last example - many celebrate the spread of same-gender marriage as a great victory for equality for LGBTQ+ people around the world without ever taking into account that marriage itself is 1. not a priority for the majority because 2. most have far greater and more pressing issues to deal with that are being ignored in favor of marriage. Generally, those within the community pushing for marriage as the Number 1 issue are financially better off, more likely to be white and cisgender; and as far as representation goes, men are more likely to be the face of the cause. The LGBTQ community is largely made up of women of color, many of whom are transgender and multisexual/mutiple-gender attracted. However the narrative being pushed to the front is that of those whose voices are the "loudest" - those with the most privilege/advantages within the entire grouping. It is not by any means a homogenous group just because there is a "shared" label. Failing to take into account "subgroup" identities has actually caused more inequality within the "community." Trans women, who were at the forefront of the rights movements, are shoved aside, ignored, and/or told to either hop on the marriage bandwagon or stay silent about their pain. Homeless people, many of whom are young, trans, and of color, will not suddenly get safe housing because they can legally marry someone of the same gender when they're old enough. Marriage won't protect against job discrimination, or racism, cissexism, ableism, and misogyny both within the "community" and out. Trans people of color, mostly trans women of color, are far more likely to be the victims of hate crimes or commit suicide - according to GLAAD, in 2011 about 87% of murder victims were people of color. "Intersectionality means more than realizing that people have multiple marginalized identities. It is a framework that requires recognition that overlapping marginalized identities impact the way people experience oppression and, thus, must impact the way advocates do work. Simply put, intersectionality is not an ideology; it's a methodology. And without it, we quite simply are not working for those most vulnerable within the community." Intersecting identities create different sets of circumstances, social structures, and systems of oppression that are unique from any of the "main" groups. It is impossible (and unethical) to force people to choose which parts of themselves are allowed to matter most at any time. Every single part of someone's identity has an impact on how they experience the world, and on how the world with treat them. Many mainstream rights movements have left the most vulnerable out in the cold because they don't account for intersections, whether in practice as seen above or in theory and discussion. It is never as simple as a "one size fits all" for any category because there is no singular identity. Therefore our attempts at finding solutions need to always reflect that. Otherwise, we're only continuing to perpetuate the same cycles of oppression against our peers, exercising our privileges and participating in harmful power structures instead of helping to dismantle them. We cannot obtain any kind of justice without addressing these facts. Please keep in mind the aims of this blog and think carefully about what you choose to say. If you're unable to afford any of these books, I may be able to locate a free copy for you. Follow J Jones's board Important Things on Pinterest. Culture of Resistance by J. Jones is licensed under a Creative Commons Attribution-NonCommercial-ShareAlike 4.0 International License. © 2015 J. Jones. Simple theme. Powered by Blogger.